The beginning of the year typically brings a swell of spring/summer music festival lineup announcements and the customary webspace bickering about who's on and who's off each poster and the preferential disputes over font size. 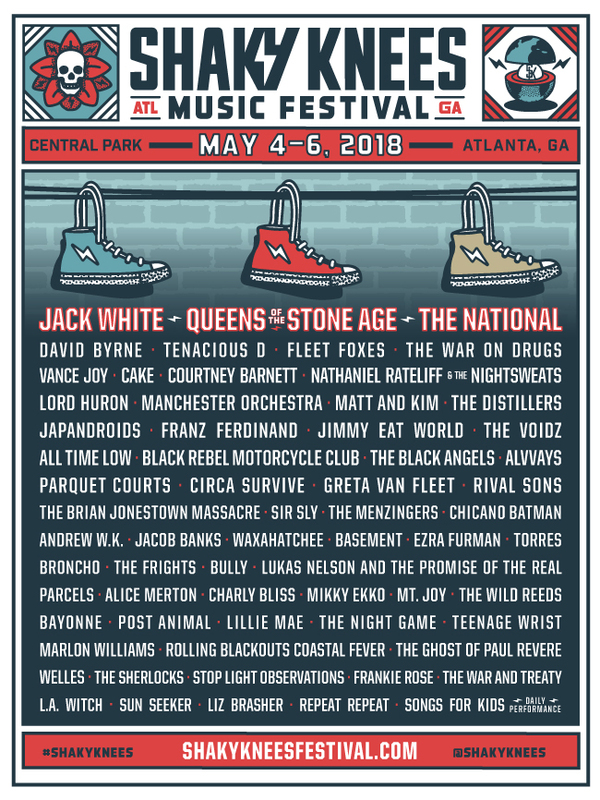 One we've come to anticipate most is the May weekend in Atlanta, GA for Shaky Knees Music Festival, known for their indie-heavy convention. With an assortment of wristbands from the traditional campy, dusty, overcrowded fests in my shoebox of memorabilia, I can contest that Shaky Knees separates itself from the discouraging rigmarole of the giganti-fests. Short lines for food/bev, a range of stage size and intimacy, easily accessible with plenty of affordable lodging options, and a rich lineup reaching plenty of listener bandwidths. The National, David Byrne, Fleet Foxes, The War on Drugs, Courtney Barnett, The Voidz, The Black Angels, Alvvays, Parquet Courts, The Brian Jonestown Massacre, Chicano Batman, Waxahatchee, Torres, Post Animal, Marlon Williams, Rolling Blackouts Coastal Fever, .A. Witch, Sunseeker, and plenty more!